The bureau of the COMESA Committee of Governors of Central Banks has urges all member Central Banks to sensitize stakeholders to promote use of the Regional Payment and Settlement System (REPSS). The REPSS is a Multilateral Netting System with end-of-day settlement in a single currency in a multicurrency environment. 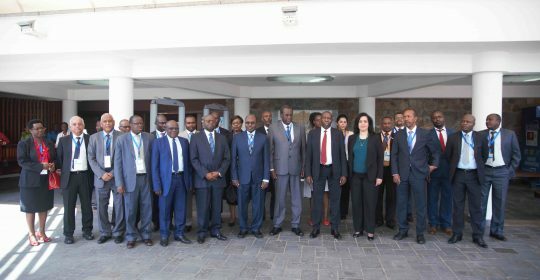 At the 38th meeting of the Bureau of the COMESA Committee of Central Bank Governors that took place in Bujumbura, Burundi, on 29th November 2017, the Governors appreciated the progress so far achieved in the implementation of COMESA’s Monetary Integration Programme. The Governor of the Central Bank of Burundi Mr. Jean CIZA who is also the Chairman of the COMESA Committee of Governors of Central Banks, underscored the importance of implementation of REPSS to promote intra-regional trade and urged all COMESA member central banks to expeditiously use it for payments. He urged central banks that went live on REPSS to conduct sensitization workshops among their stakeholders to promote the use/uptake of the system. In his remarks, the COMESA Assistant Secretary General (Programmes), Ambassador Dr. Kipyego Cheluget, said member countries had reported favourable macroeconomic performance in 2016 despite emerging development challenges in the region. He said it was within the mandate of the Ministers of Finance and Central Bank Governors of member countries to explore alternative financing mechanism along the lines of what was currently being pursued by the African Union Commission. He cited the Community Levy provided for in the Treaty as one way of financing regional integration programmes. Underscoring the importance of the activities of COMESA Clearing House and COMESA Monetary Institute, Dr Cheluget said this will enhance the implementation of the COMESA Monetary Integration Agenda. He therefore urged all member Central Banks to fully utilize the REPSS for payment of all their intra-COMESA transactions. Regarding the Tripartite Free Trade Area (TFTA), he informed the meeting that 21 countries had so signed the agreement while two; Egypt and Uganda had ratified it. During the meeting, Governors discussed the activities undertaken by COMESA Monetary Institute (CMI) and COMESA Clearing House (CCH) in 2017. They agreed on the importance of REPSS to the expansion of intra-COMESA trade. The Governors observed that the research and capacity building activities of CMI contributed to the improvement of macroeconomic management and assessment of financial system stability in member countries. They also agreed that greater monetary integration is a prerequisite for the success of COMESA Free Trade Area, Customs Union and the plan to establish the Common Market and economic community. Governors and Experts from the Central Banks of Burundi, Congo DR, Djibouti, Egypt, and Sudan, attended the meeting.